Hollywood action movie-star Steven Seagal weighed in on the recent NFL protests involving players who took a knee during the national anthem. Seagal is not happy with what he saw. In a live interview in Moscow with British journalist Piers Morgan on ITV’s “Good Morning Britain” show, the actor said he believed in free speech but not the “disgusting” NFL protests. “I believe in free speech, I believe that everyone’s entitled to their own opinion, but I don’t agree that they should hold the United States of America or the world hostage by taking a venue where people are tuning in to watch a football game and imposing their political views,” he told Good Morning Britain on Wednesday Sept. 27. Seagal added, “I think it’s outrageous, I think it’s a joke, it’s disgusting. I respect the American flag. I myself have risked my life countless times for the American flag and I don’t understand or agree with this kind of behavior. I think it’s an outrage,” he said. In talking about him risking his life, Seagal could be referring to his time spent as a deputy in Hudspeth County in 2011 and with the Jefferson Parish Sheriff’s Office in Louisiana in the reality series “Steven Seagal: Lawman,” according to UPI. 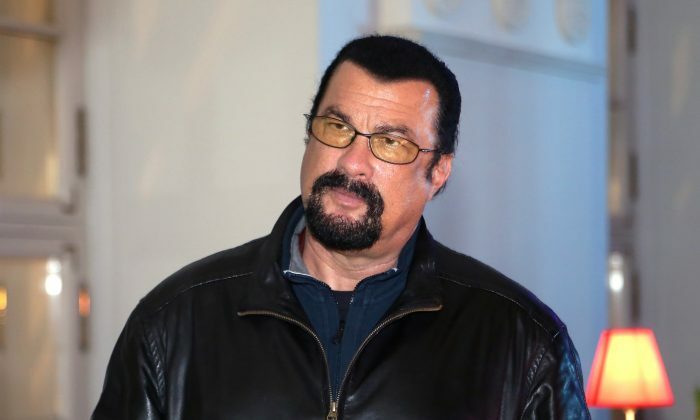 Seagal, who recently became a Russian citizen then gave his views on U.S. President Donald Trump. According to the Washington Times, Seagal still owns a home in Louisiana. He was granted Russian citizenship in 2016. Seagal’s comments soon made it into the top 10 trending topics list on Twitter. Rep. Mo Brooks (R-Ala.) on Tuesday called for a total end of federal government support for the NFL as players continued to disrespectfully kneel in protest. “I believe we ought to terminate all federal government support of the NFL,” Brooks told Breitbart News. “That would include the termination of any and all advertising that is done on behalf of the federal government—military and nonmilitary—to the extent we do any,” Brooks said. Brooks is the U.S. representative for Alabama’s 5th district and a member of the House Freedom Caucus. “The same thing with any other professional sport that insults our country and our flag and our anthem as the NFL has done,” he told Breitbart News. NFL teams reportedly receive billions of dollars in subsidies from American taxpayers, CNN Money reported in 2015. What’s more, NJ.com revealed in a 2015 report that more than a dozen NFL teams received money from the Defense Department in exchange for advertising and other forms of promotion for the military. The Jets got paid a total of $337,000 between 2011 and 2014. The money increases to $5.4 million when calculating the overall amount the Defense Department paid to 14 NFL teams during that time. Out of that amount, $5.3 million was paid by the National Guard to 11 teams under similar contracts, according to NJ.com. Brooks reaffirmed his comments on Twitter and drafted a letter to Trump urging him to honor the American flag and anthem “by stopping all Department of Defense and federal government support” for all professional sports teams that “display disrespect” for our flag and national anthem.